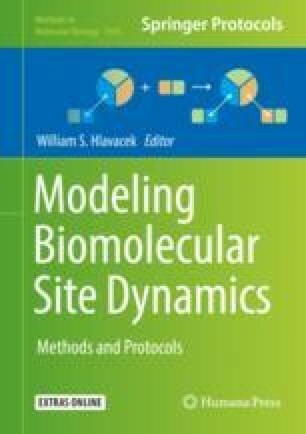 Mechanistic models of biomolecular processes are established research tools that enable to quantitatively investigate dynamic features of biological processes such as signal transduction cascades. Often, these models aim at describing a large number of states, for instance concentrations of proteins and small molecules, as well as their interactions. Each modeled interaction increases the number of potentially unknown parameters like reaction rate constants or initial amount of proteins. In order to calibrate these mechanistic models, the unknown model parameters have to be estimated based on experimental data. The complexity of parameter estimation raises several computational challenges that can be tackled within the Data2Dynamics modeling environment. The environment is a well-tested, high-performance software package that is tailored to the modeling of biological processes with ordinary differential equation models and using experimental biomolecular data. In this chapter, we introduce and provide “recipes” for the most frequent analyses and modeling tasks in the Data2Dynamics modeling environment. The presented protocols comprise model building, data handling, parameter estimation, calculation of confidence intervals, model selection and reduction, deriving prediction uncertainties, and designing informative novel experiments. This work was supported by the German Ministry of Education and Research through the grants SBEpo (Grant No. 0316182B), EA:sys (Grant No. 031L0080), and LiSyM (Grant No. 031L0048).